As Arlo Guthrie optimistically said at a concert recording with Pete Seeger*, "You can't have a light without a dark to stick it in," meaning you can't have good without bad. He was introducing a routine about the "neutron bomb" (a radioactive explosion which kills people but leaves building, land, property and stuff intact) and his dream of an "un-neutron bomb" where "all the buildings melt, and all the guns disintegrate and there's nothing there but flowers growing and... there's naked people everywhere!" I woke up thinking about the relationship between shredding good stuff and the shortages it creates for un-shredders to mix in more bad stuff. For every action, there is an equal and opposite reaction. It's basic economics 101 and I've written about it ad nauseum, most recently in the decription of recyclers A-B-C-F last week. As exporters cherry pick good stuff to economically sustain their toxics-along-for-the-ride [TAR], recyclers shredding the picked over material increasingly believe that what they are shredding is the same as what the exporters are shipping, and they encourage environmental groups to believe that the exports are all bad. The enviro groups visit overseas (e.g. Ghana) and find mostly junk on the ground (duh.. the nice stuff is not at the dump, morons, it's at a doctor's office) and exhibit the photos of residue as proof of what was really in the containers. They sign monetary deals with no-intact-exporters and shredders to promote their standard. "No intact unit", the worst idea to come out of anyone's mouth throughout this decade of debate, is promoted all the way to national legislation. "Safe Exporting" will win, it's just a matter of how long the bad policy lasts and which humans get rich off it. If good people supply more good stuff, the market won't tolerate bad stuff mixed in. If the market is offered no choice, the market will invest in processes to deal with the bad stuff mixed in. The writing is on the wall. Whether as a requirement of Fair Trade of exports, or in order to protect the money they made from imports, the importers will "put air conditioners in the sweat shops", just as they did when Levis tried to use press criticism of Kathy Lee Gifford to sell $70 blue jeans. There will be a white marble, velvet glove, eat off the floor e-scrap recycling operation outside of the USA. I don't know if it will be one of our good WR3A companies, or a prodigal competitor, or what. I just know it will happen. I read the history of Caterpillar's discovery of refurbishing in Malaysia more than a decade ago, and just as they said "can't beat em join em", I think the OEMs will probably be the ones who re-contract contract assembly to be contract disassembly. Whoever it is, we hope that the millionaires created by the reaction against prohibition policy will be more Kennedy than Capone. When the prohibition on exports succumbs to excellent processes overseas, which were created in reaction to denying those markets the nice stuff they were actually asking for, I won't be holding a million dollar lease on a MaSeR machine. As for the Un-Neutron Bomb, I opened this morning's NY Times and found this article, with the provocative title "A New Clue To Explain Existence," about some results from the massive multi-billion dollar matter and anti-matter colliders. Never has so much money been invested to create a lab so big to smash something so small (electrons and anti-matter electrons). But massive shredding facilities built to deal with the "replaced capacitor" (BAN.org's objection to export-for-repair, they said the capacitor must be removed before the computer is exported), follow that trend. Hopefully with a result: "A New Clue to Explain Existence of a junk CRT shipped to Ghana". As tired as I am of blowing on the embers, I do see the flame growing. Demand for product and people interested in WR3A are all growing. But it has yet to break into the mainstream media, the story remains all about bad exports, which certain non-profit orgs have made money talking about. I am sometimes guilty of creating more heat than light, a super-colider in my own blog. But I can't play a guitar. I'm trying to reach people the same way Pete Seeger drew small crowds to clean up the Hudson River, but using the tool of the internet to sing about the truth my own way. What is really a trip is that practicing "safe exports" exposes companies like mine to the same kind of criticism leveled against hippies who smoked illegal marijuana at Woodstock. Parents were told horrible things about the marijuana and the marijuana smokers. It was counter-culture, by definition, to say that these were nice people who were basically not wanting to hurt anybody. 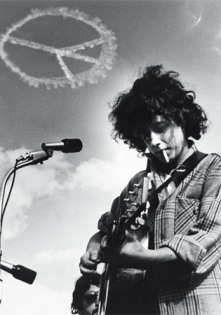 If you outlaw something, like hemp, you turn a bunch of people into criminals, whether they WERE criminals (and don't kid yourself, many people in the marijuana trade are murderers) or NOT (Arlo Guthrie did not murder people). the laptop's missing a couple of keys. Don't check my bags if you please, Mr. Customs Man. Hopefully, as with the results of the anti-matter colider, what matters comes out ahead (sigh... the likelihood that someone reads this blog, the NYTimes article, and realizes how funny that pun is pretty small result to invest this much wordsmithing into). 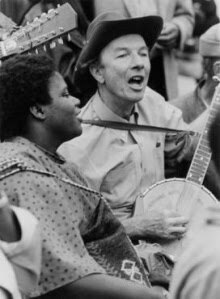 Oh, and here is the other reference between the lines of this blog: Pete Seeger... the guy in the Precious Friends concert with Arlo Guthrie... was one of the most famous blacklisted innocents from the McCarthy anti-commie campaign. My recycling company may never make it to the top of Billboard, but I'd rather live my life as Pete Seeger than as a Michael Jackson. And every once in awhile, the Smothers Brothers Comedy Hour breaks the blacklist and invites me to talk about exports. * Happy 90th birthday, Pete! You already won the Nobel Prize in my book.